What would you do if your four-year-old son claimed he had lived another life and that he wants to go back to it? That he wants his other mother? Single mom Janie is trying to figure out what is going on with her beloved son Noah. Noah has never been ordinary. He loves to make up stories, and he is constantly surprising her with random trivia someone his age has no right knowing. She always chalked it up to the fact that Noah was precocious—mature beyond his years. But Noah’s eccentricities are starting to become worrisome. One afternoon, Noah’s preschool teacher calls Janie: Noah has been talking about shooting guns and being held under water until he can’t breathe. Suddenly, Janie can’t pretend anymore. The school orders him to get a psychiatric evaluation. And life as she knows it stops for herself and her darling boy. For Jerome Anderson, life as he knows it has already stopped. Diagnosed with aphasia, his first thought as he approaches the end of his life is, I’m not finished yet. Once an academic star, a graduate of Yale and Harvard, a professor of psychology, he threw everything away to pursue an obsession: the stories of children who remembered past lives. Anderson became the laughing stock of his peers, but he never stopped believing that there was something beyond what anyone could see or comprehend. He spent his life searching for a case that would finally prove it. And with Noah, he thinks he may have found it. Soon, Noah, Janie, and Anderson will find themselves knocking on the door of a mother whose son has been missing for eight years. When that door opens, all of their questions will be answered. 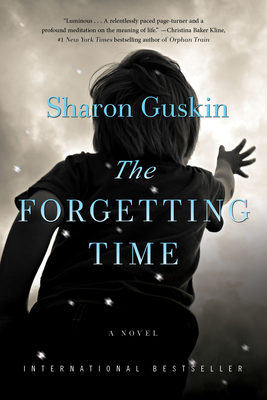 Gorgeously written and fearlessly provocative, Sharon Guskin’s debut explores the lengths we will go for our children. It examines what we regret in the end of our lives and hope for in the beginning, and everything in between. SHARON GUSKIN lives in Brooklyn with her husband and two sons. The Forgetting Time is her first novel. "Bold, captivating...Guskin amps up the suspense while raising provocative questions about the maternal bond and its limits...You'll be mesmerized." "For fans of Cloud Atlas and The Lovely Bones, this psychological mystery will have you hooked until the case is closed—or is it?"